LOOKING FOR A NEW HAMPSHIRE FOOT DOCTOR? Your feet are the foundation of your body and you deserve a healthy foundation that is free of pain! At Nagy Footcare, our best day is the day you wake up with no foot pain. Patients come into Nagy Footcare with all types of foot conditions including general foot pain, heel pain, bunions, foot and ankle injuries and ingrown toenails. You have choices in your health care and we invite you to do your research before deciding who to trust with your feet. Dr. Nagy is a board-certified podiatrist and qualified HyProCure® surgeon, offering full services for all foot related health issues. We welcome you to walk through the website to learn more about our services as well as what we believe really matters in caring for our patients. So, take a look around, feel free to download any of our resources, and then let us know how we can help you. We have offices in North Hampton and Somersworth. You can contact us via email if you would like to ask us a specific question, or just call our offices for an appointment. "I had so much confidence in Dr. Nagy that I wasn’t even nervous. Dr. Nagy listens and he explains everything to you. I knew everything that was going to happen. He talks to you before the surgery. He'll show you on paper exactly what he's going to be doing. I went in his office in North Hampton, and I was awake through the whole thing, and they played music, and they talked to me! It was so easy." 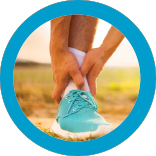 “I want to thank Dr. Nagy for being persistent to tackle my plantar fasciitis. It is so nice to walk without any pain in my foot. I will highly recommend his practice to all who seek foot pain relief. " "If you had feet like I had, and you had an experience with Dr. Nagy, you would praise him all day long. I can’t say enough about how successful it was, how painless it was, and how easy it was. The recovery was great, and the results were perfect. I just keep looking at my foot, and say, ‘Oh, you are so beautiful’. "